It seems every time we blink Liberty London Fabrics has a new collab going — and that's to our greatest delight. The latest is with Pottery Barn Kids and PBteen. 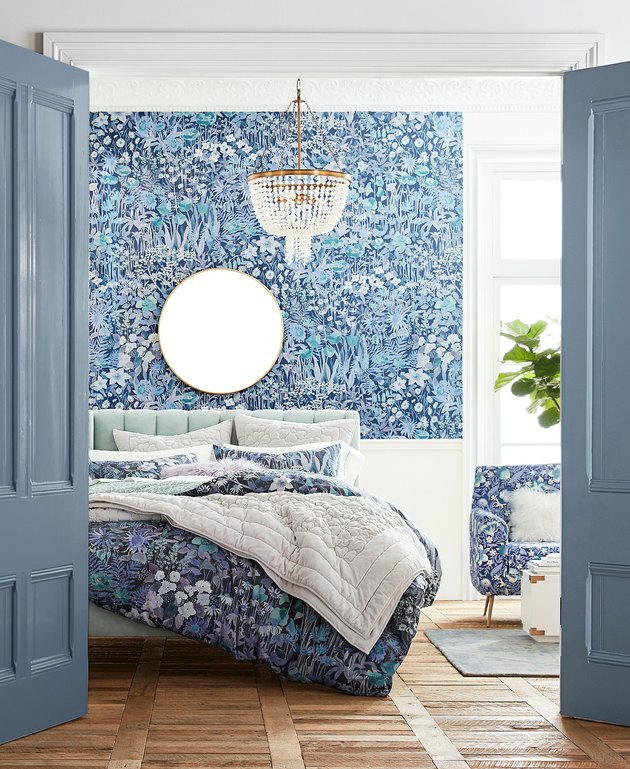 The 143-year-old British print design and textile house is offering seven of its hand-drawn prints to use for the first time on furniture, bedding, decorative accessories, wall art, nursery essentials, and school gear. And the pieces turned out so stylish that we would low-key consider buying them for our own — very adult — apartments. The collaboration is broken down into kids, nursery, and teens. There are more than 30 pieces in each collection. Everything is available online now, and will be in stores in July. Pastel pinks and grays stand out in the Pottery Barn Kids pieces, which are covered in Liberty's Forest Road — a botanical print combining dense decorative foliage and a variety of flowers — and Edgar's Garden — a "repeating stylized floral print with bold black outlines." The nursery collection is based on the British nursery rhyme The Lion and the Unicorn with its Mythical Forest print. This print is inspired by "medieval tapestries depicting peacocks, lions, and unicorns amongst a trail of purple embroidered meadow flowers." And finally, the teen collection is all about moody and dramatic prints of foliage and florals. The Faria print was originally a watercolor painting. It's a "modern floral in cool hues of blue and purple." The Forest Road print can also be found in the teen line.